Eureka -- thanks to an Orfeos newspaper blurb and a missing photograph! 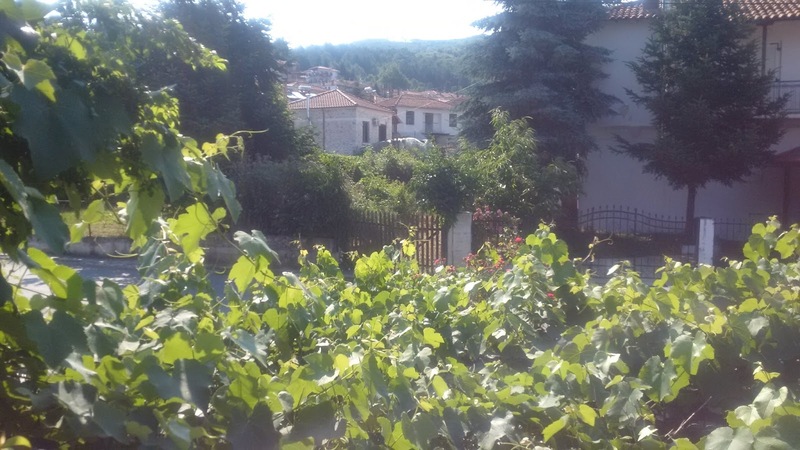 As previously posted, I had visited Neos Skopos in Northern Greece on 6/21 in my quest to learn something more about my grandfather, Xanthoulis Xanthopoulos -- a man from Skopos, Turkey, that we know next to nothing about before he married Paraskevoula Koutsoukis in Naousa circa 1916...except the names of his parents, Efstathios and Kokosill (as noted on his 1941 death certificate). No one I spoke with that day knew anyone who might be related to me. And I was told there was no K name Kokosill in the Skopos tradition, but there was a name Kokony. 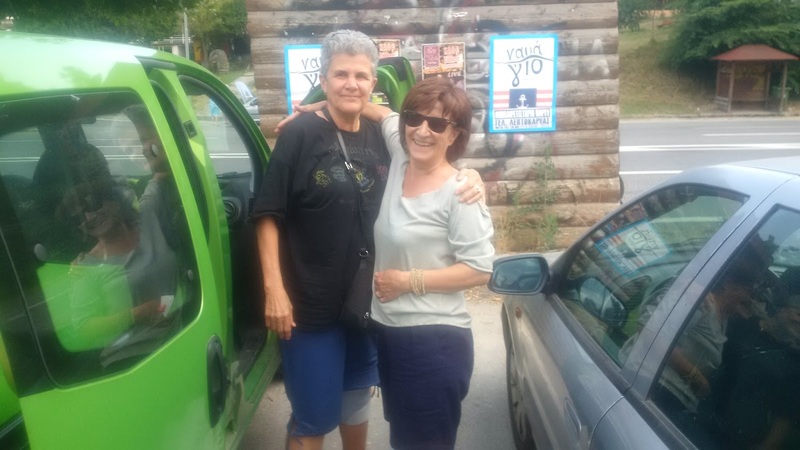 20 days later and on the night before I left Thessaloniki, I spoke with someone who had read the newspaper and given me a call. 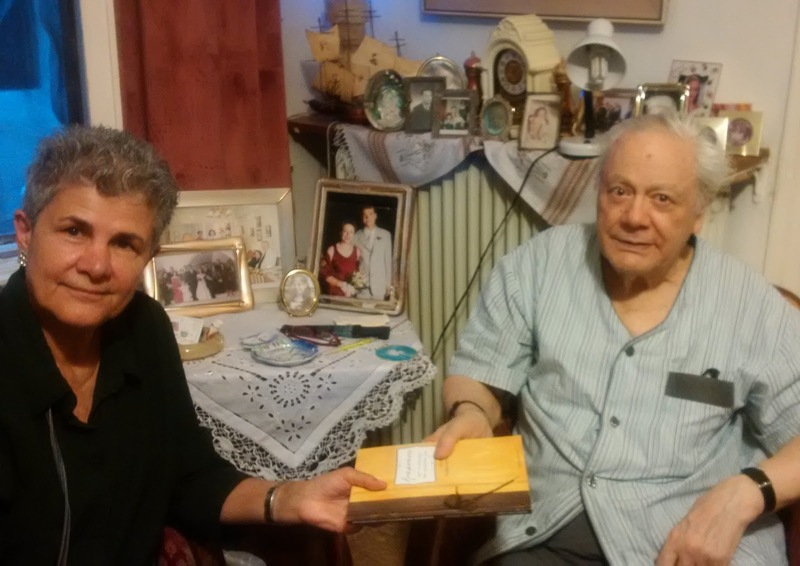 Her maiden name was Eleni Xanthopoulou, her grandparents were named Efstathios and Kokkony...and she remembers being told that her Yiayia would go to Naousa to visit relatives. Eureka! 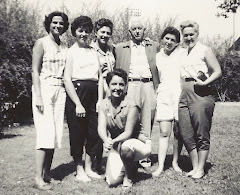 Eleni said that somewhere she had a photograph of four people that was received with a box of clothes many years ago, and she was sure that I was in that photograph. Out-of-the-blue she referenced Stockton, California. I was stunned! This was the first person on the Papou Xanthoulis Xanthopoulos side of our Family Tree that I have ever located -- made possible because the "Syllogos Orfeos" in Neos Skopos was kind enough to publicize my quest. And then Eleni, who lives in Serres, happened to see that notice. We did not have time to meet in person this trip, but we have an exciting connection and something to build on. NOTE: If you have queries about Skopos relatives you can write to Theodoros Voyiaris, President of Orfeos in Neos Skopos, Serron, Greece T.K. 62100...or call him at 306949535354. Good luck! 51 and counting, in spite of all the troubles! Left Greece yesterday firmly believing that the ship I am temporarily abandoning is, for all intents and purposes, unsinkable -- and if you are at all familiar with the history of Greece the last 100 years, you know what I am talking about. The Greek people will never go down without fight! The newest proposed austerity measures look to be worse than ever, with just vague prospects for economic recovery. The lack of cash has caused a cascade of serious problems that most American citizens would find unbelievable AND intolerable. It was impossible to see the end of the tunnel if The Creditors do not cut the debt, like others did for Germany in 1953. That is why Greeks followed the lead of Prime Minister Alexis Tsipras and voted OXI (NO!) in the July 5th plebiscite. I am very proud of how they stood up for themselves no matter who is to blame for the current situation and how nasty Herr Schäuble has become. For the last 6 weeks, I ran around trying to find relatives and then graduates of the American Farm School's Girls School Department...forays into towns and villages which gave me even more insight into the economic situation. I worked at the School in 1968-78 and was pretty tight with the students and their families. I kept in touch with many up until about 1985, then radio silence...my fault. Now the floodgates were open! So how do I explain that I have now ‎visited with 51 such graduates who acted as if 40+ years have not gone by? "Miss Paula" is now much older and overweight, but they don't seem to care...maybe because some of them aren't so svelte any more either. The beautiful, mind-blowing way I was greeted went beyond my wildest expectations.‎ I could have stayed 6 months if I took them all up on their invitations to stay in their homes! Most importantly, these now 50+ years-old women loved getting together with others they had not seen or heard from for many years as I went around gathering them up and sharing contact information. They loved talking about their school experience and how important it was. Eleni, Tassoula, Fotini, Aleka, Mairi, Despina, Chrystallo, Isaiah, Peristera, Glykeria -- some are widows, others are still working hard (at the very least helping pick cherries or peaches or olives during harvest seasons in their hometowns), and most are grandmothers tending to large extended families challenged daily by these severely depressed times. So my new and unforeseen mission in life is to reach them all, creating some sort of network/association for today -- to renew the friendships they had, share their life experiences, and help each other when they can. 51 was great, but 232 will be a whole lot better. 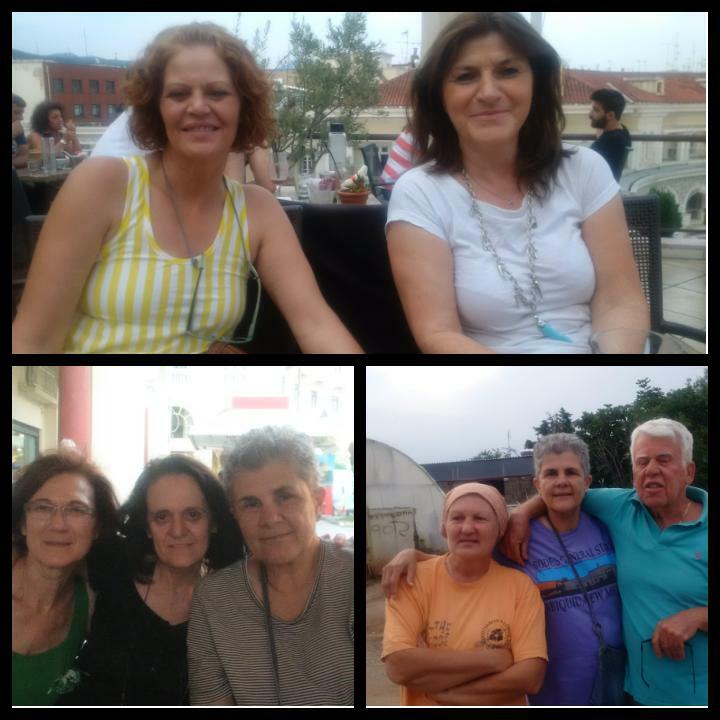 NOTE: A big shout-out to my partners in crime (above top photo), Vasso'74 ("Sherlock Holmes" as I dubbed her and a leader in her Kavala area village) and Ioanna '73 (hostess, driver par excellence, and teacher in a special needs school for 26 years!) -- who not only came along for the ride‎, but organized a good bit of it. They seemed to enjoy those encounters even more than me and are working on the next phase as we speak. Double Opa! Sadly, Greek life on eerie hold -- to put it mildly! Currently visiting the beautiful village of Neohori, Halkidhikis. 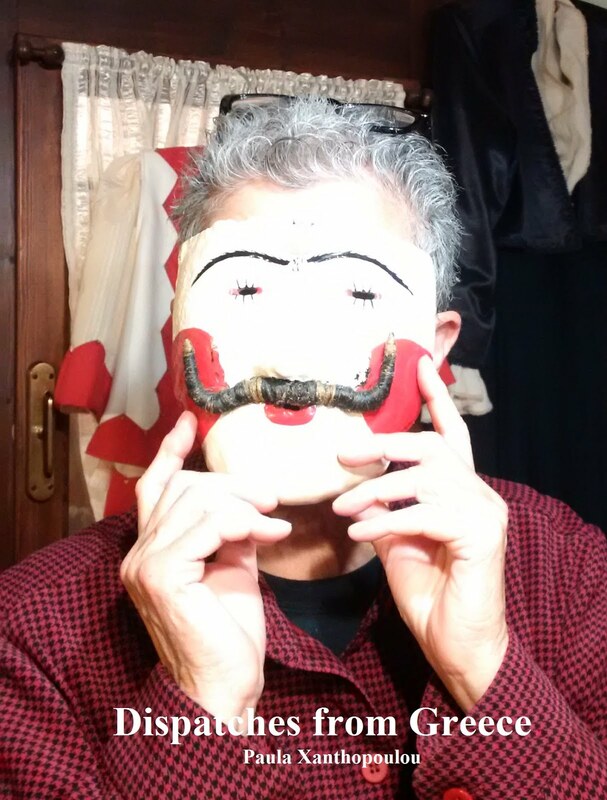 On the one hand it's business as usual -- with a panigyri in progress nearby along with other normal happenings and flawlessly cheerful hospitality wherever I go. On the other, there is a giant elephant in the room. Life here in Greece is on eerie hold in anticipation of a referendum on whether Greeks would accept the last EU offer for continued financial aid coupled with increased austerity measures. Greece refused to sign unless such a deal included debt reduction. Indeed, an IMF report 2 days ago has now affirmed the government's insistence all along that without debt reduction, the economy is not sustainable -- so why torture the public more just to follow a policy that has only created a growing humanitarian crisis? It seemed logical and clear a week ago: OXI means no more of the same and NAI means hit us again harder after 5 years of taking our medicine with no end in sight. 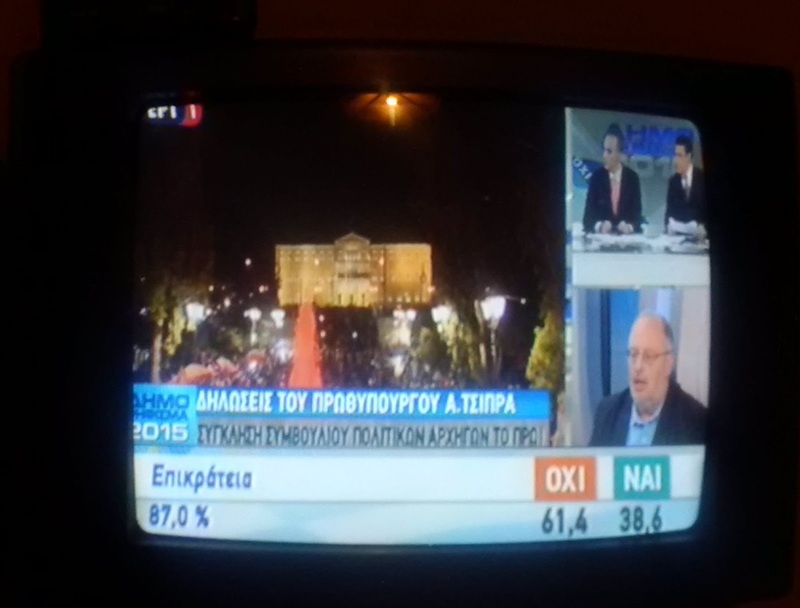 Unfortunately, the Greek public has now been inundated with fear-mongering rhetoric (think Fox news on steroids!) and numbing banking controls ‎that have recast the vote into Europe/Eurozone NO or YES, when that has NEVER been the intent or goal. And to make matters much more dangerous, European creditors have been openly campaigning against the OXI vote in hopes of bringing down a democratically-elected government they disagee with, but which came into power last January because Greeks said we can't take this any more. As far as I'm concerned, such blatant interference is TOTALLY unacceptable regardless of anyone's political leanings. Greek politicians not in power and who previously went along to get along, are‎ furiously doing everything they can to undermine the government and confuse the public. Polls show that the vote is too close to call, when just a week ago people said who would be stupid enough to vote for more pension cuts (already at almost 40 percent) and more taxes on food and medicines? After waiting at ATM lines to get their daily Euro allotments and being unable to pay the rent or make other necessary purchases, Greeks now think a YES vote will mean all will return to normal -- conveniently forgetting that some of them in the public and private sectors have not been paid for months in a stagnating economy that did not just get that way under the present government, no matter how you slice it. It's pretty scary to think no one really knows what will happen no matter how the vote turns out. Rumors and accusations abound. Prime Minister Tsipras goes on TV daily to urge people to remain calm, hold their heads high, and vote OXI for the ‎betterment of their country in the name of democracy. Demonstrations pro and con grow larger, dotted with foreign celebrities. Meanwhile people are scampering to get back to wherever they are registered in order to vote -- when they are not waiting at ATM machines under threat of further hardship, having difficulty trusting anything they hear. I'm afraid to turn on the TV, hoping this will al go away if I don't. "Whatever happens, we will manage somehow like we always have" is a typical response by regular people trying to disguise growing anxiety and anger over a situation that has now become inexplicable as well as unfathomable. Sadly, Greek life is indeed on eerie hold-- to put it mildly! 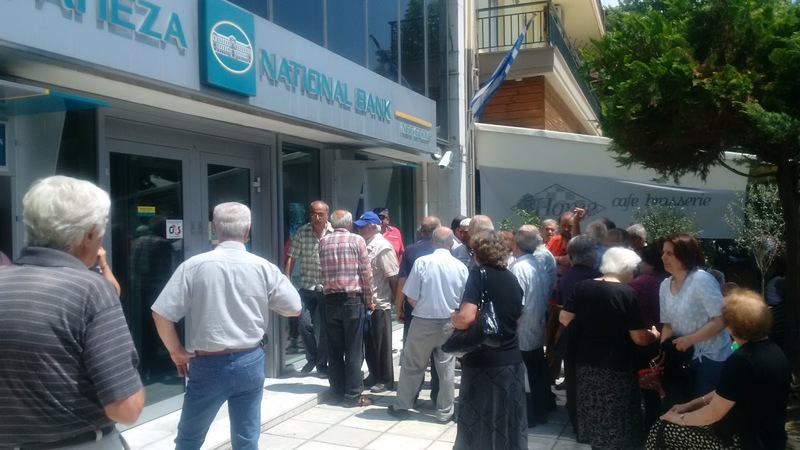 The rather bleak financial situation here in Greece has not stopped me from visiting with relatives wherever I can find them, including in my Dad's hometown of Naousa where I just spent 6 days. Going back there was hard because my closest contacts had "left" as the Greeks say when talking about those who have passed away. 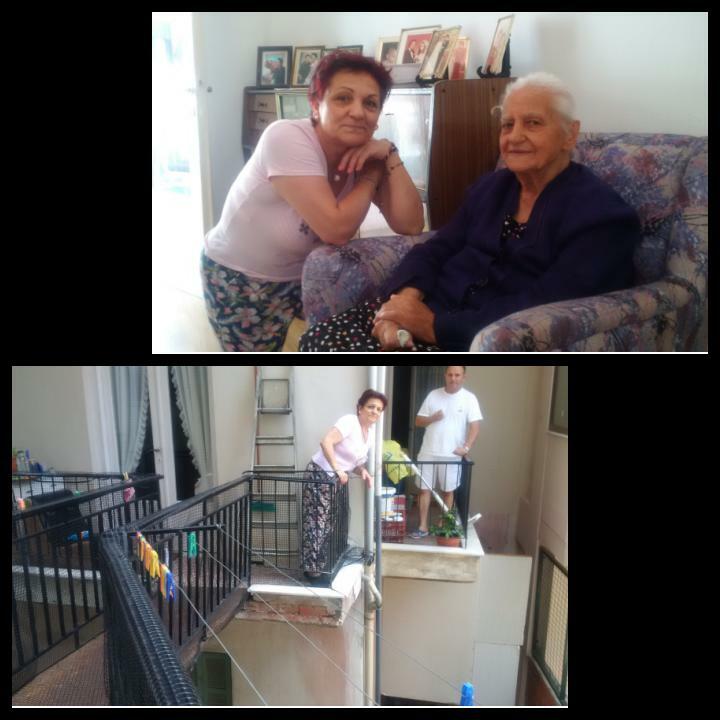 That included Alkinoy and Christos Lalas (Yiayia X's first cousins, at whose home I usually stayed) and their son Tassos, who died suddenly last August. He was my age and partner in crime whenever I visited Naousa. Zoi se mas. So I made it my business to connect with others, starting with the oldest relatives on my list. Time to put more faces on those names! Christos Lalas had 4 siblings who altogether produced 18 children, none of whom migrated to the States. His sister Elizavouda, is now 91, lives alone, and is no slacker. Her daughter Dina lives in the building next door, and they have installed an ingenious steel bridge to connect the two. Amazing, I still can't get over it! Very happy to also meet Tasso's daughters Ethimia and Alkinoy...but first a sweet visit with my father's cousin Dr. George Koukoulos and his wife Roi. I have an old photograph of me and my parents having lunch with them and brother-in-law Angelos Valtadoros circa 1972, seemingly at a restaurant in Aghios Nikolaos Grove. My "Uncle George" -- at one time the town's main doctor -- is still going strong at 91 and has written a very interesting memoir. They still live in his ancestral home, which on the ground floor once housed his father's store and then his doctor's office...and they still navigate a rather frightening, no-handrail wooden staircase that winds up to the second floor. Dr. George Koukoulas gives me a copy of his book! 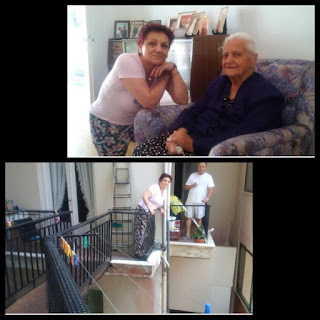 ‎I was invited by a 1978 Girls School graduate to have Sunday lunch at her home in the Alonia neighborhood -- on the same street where my dad grew up in the 20's and not far from where my Yiayia's ancestral home once stood. Despina's kids go to "Yalakia," a grammar school that just celebrated its 160th birthday and which my father attended before leaving for America in 1929. She gave me a book and CD celebrating that anniversary...could Efstathios Xanthopoulos be in that photo on page 36 of the 1926-27 second grade class ? Many miles and many years did not mitigate against family roots and renewed relationships. It is indeed a small world we live in...and thus we need to pay attention to what's going on in Greece and support our enduring "patrida." Lots of ugly things have gone down here in the last 100 years, most not the fault of the Greek people per se. 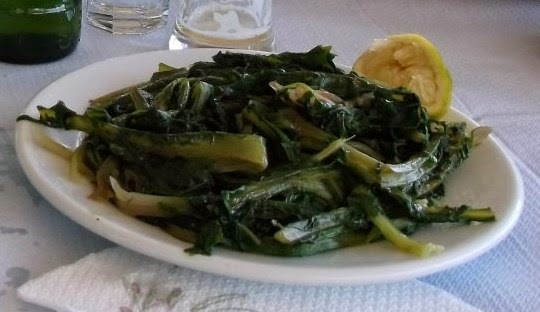 ‎They have suffered enough, in more ways than the average second or third generation Greek-American can fully appreciate. That's my story, and I'm sticking to it. Zito Hellas! NOTE: How has globalization affected Naousa? Beginning in 1875, renowned textile factories provided work and prosperity for over a century. Many factory buildings dot the Naousa city landscape -- and now, except for one, they are depressingly shuttered because such goods could be produced much more cheaply in China and Pakistan. Even the famous Naousa area cherries and peaches -- and most people were spending mornings these days picking/processing in their family orchards -- bring little profit anymore as foreign markets have fizzled and middlemen drag their feet paying the farmers. Very tough times indeed!